waiting patiently to be turned into a Klaralund sweater I seemed to have knit a load of squares! So far I'm knitting number 9 - this is the first 6 drying after a soak. I've nearly finished all my bargain Kureyon wool and have to buy some more. I love how the colours are coming out - I'm just leaving the colours random, although I did pull out a black-on-black section I managed to create. I was planning to knit 24 squares (6 x 4) for a throw, but Nigel is asking whether I can knit a cover for our queen bed...I'm going to see how I feel after 24 squares as to whether I want to go on to 30 or 36! 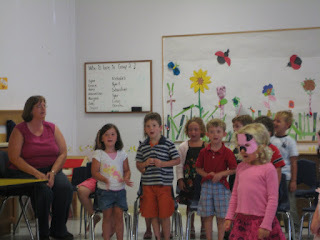 Friday was Finlay's last day at his Jr K program. They ended the term with a play; "The Three Little Pigs". Finlay was in the choir. The play was followed by a picnic in the playground. They had a face painter and a balloon maker...the balloon guy said he had never been asked to make a balloon weasel before! Yesterday we went to Dixon, CA to attend Lambtown 2008. 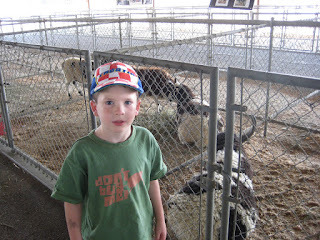 It's a small-town agricultural show in a rural area. 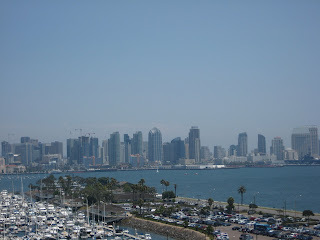 Its a 2-hour drive from us, but made a nice day out. We got to see some of the sheep entered in the competitions: Here Finlay and Adam quiz the owner of these lovely St Croix sheep. These dont need shearing as their fleece falls out in the summer - a side-effect of living in the caribbean I suppose. Here Finlay poses with some tired Jacob's sheep. 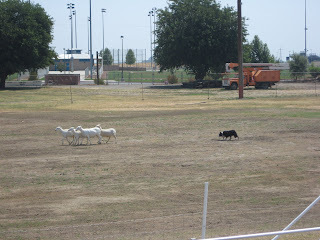 We spent some time watching the sheepdog trials, and talked afterwards to the woman competing with this dog. Her dog was 10 and approaching retirement - the dog was enjoying a bucket of ice cubes while we chatted. 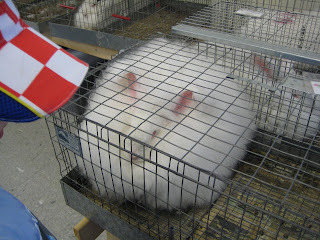 There was also an angora rabbit competition. This is a thistledown breed...I think you can see why. 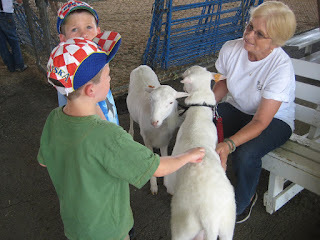 One of the other breeders let the boys pet some baby rabbits. I had a little wander around the yarn/fiber shed and made a few small purchases, including some alpaca yarn from an alpaca called Fernando... I talked to the breeder...its nice to know exactly where your yarn comes from! We had a great day out - managed to eat some lamb (the boys would not!) and headed home for a swim. The central valley was a mild 93 degrees when we left - usually I think the temperature is a good 10 degrees warmer this time of year so we were very lucky to meet such a mild day. 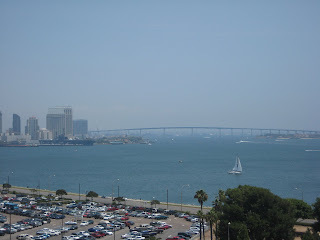 I did manage to sneak a few moments sitting on the balcony with my knitting. I made a dress a few weeks ago. 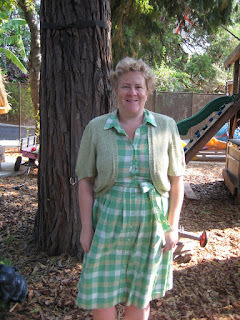 The pattern is Simplicity 3831. I used some Liberty lawn that Christina gave me. The dress is hard to see in this photo (which is what happens when you ask 7-year-olds to take your photo), it looks rather stiff. In reality it has quite a nice drape. The style features an empire waist, slight under-bust gathers, a shaped skirt, split flutter sleeves, and a back zip. It is self-lined, but I didnt have enough fabric to line the skirt so I sewed the bodice facing down at the waist and left the skirt unlined. I changed the bodice; replacing gathers with darts and added a single pocket in the side seam. Interestingly I found the pattern extremely confusing. It was written in both Spanish and English and I felt that the quality of the explanation was poor. Each step in the process was also not illustrated, and it took me some time to understand which way to insert the sleeves for example. 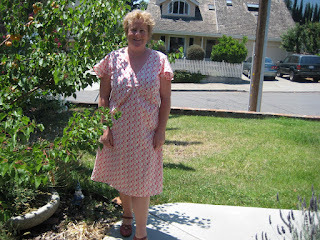 I think if I had been a beginner dressmaker it would have been a very difficult pattern to follow, which is a pity because the pattern achieves a nice style with little effort or time. I've started a new project, and rather unexpectedly, it's a blanket. I always insisted that I would not knit a blanket (called Afghan by Americans...no idea why) and could never imagine that I would have the patience to knit something that large and boring. 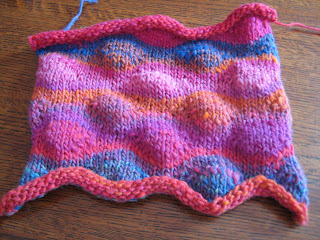 Noro Kureyon in colour 102. The eagle eyed will notice that its knitted with too few repeats - what is especially galling is that I knitted the 4 repeats (as specified in the pattern) then ripped out the 4th due to an incorrect reading of the pattern. I have since printed a version of the pattern in a large print so I dont have to keep putting on my glasses to read it while knitting. I think this is a good solution to my desire to knit the beautiful colours of the Noro yarn, without really having a need for any more handknit sweaters ever! I finished my silk shrug, I'm pleased with it - apologies for the fuzzy photo (especially to Madoka...but you can see it in person). The pattern is from Erica Knights "Classic Knits" and it's knitted in 5 skeins of Debbie Bliss Pure Silk in the Celery colour. Confusing - and unnecessary since the real instructions could have read something like "continue for 28 rows increasing on front edge every 4th row, and at side edge every 10th row"... I find patterns like this very frustrating as it's really just lazyness. The guernsey pattern was also like this - but it was an older pattern book - Classic Knits is a new book and I guess I expect better. The shrug also used 5 skeins, yet according to the yardage estimates (for a different yarn of the same fibre and guage) indicated that 6 would not be enough. 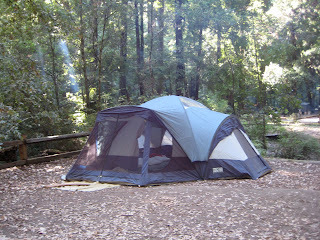 We spent the 4th July holiday at Portola State Park. I'm so glad that this park, which was under threat of closure due to state funding cuts, has managed to remain open. It's my absolutely favourite place to camp; the sites are not too crowded, and the park is not crowded. It's so peaceful to sit out under the redwoods, especially when the bay area is hot, the redwoods are cool, even cold at night. 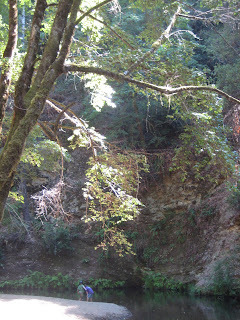 There is a creek running through the park which provides plenty of opportunity for exploration. I have never seen Pescadero Creek so low - we saw only tiny fish - presumably the larger ones can't get up stream this far. 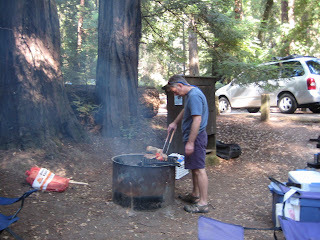 ...nice bottle of red, couple of steaks, and sausages for those who prefer them, followed, of course, by smores! I was in Gaithersburg last week for a class. As usual I knitted during the class (after checking with the teacher). I find that the automatic manual action of knitting focusses my mind on the topic; I suffer less from drifting attention when I'm knitting. I needed the focus as the class was quite hard work at time. The socks are for Nigel. Knitted to the usual recipe in a 3x1 rib. 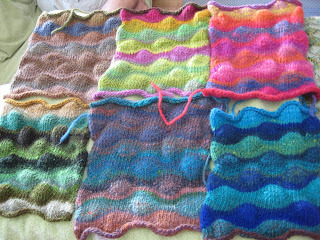 The wool is Regia in the Kaffe Fassett colour range. Colour is 4257. 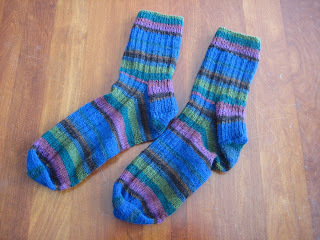 Its great sock wool: 75% superwash wool/25% nylon - machine washable and durable - but still soft, especially after washing. I'm also very taken with the colours which are lively without being lurid....that Kaffe knows his colours! These socks are for Izhar who was responsible for much of the class. Again, the usual recipe, but this time in a simple stockinette so as not to overwhelm the pattern. The yarn is Schoeller & Stahl Fortissima colori in shade 4006. 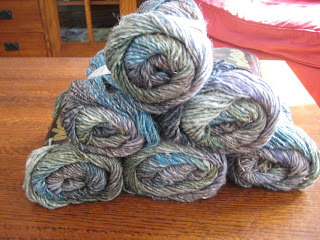 Its a 6-ply so a little thicker than the usual, but not so thick that you could not wear shoes or boots with them. Again a machine-washable wool and polyamid blend. 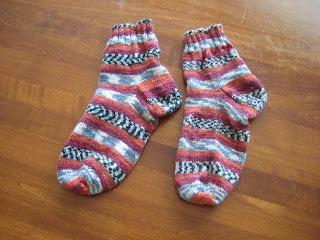 So, not only a worthwhile class, but a week of productive knitting too. However, I took River Rock with me planning to knit on that in the evenings, but with email and dinner I did not a single stitch on it all week.